It’s hard work being a guide dog! It’s a normal enough question. The kids in my neighborhood ask me that all the time, especially when we’re standing in line at the (world’s best) ice cream stand, just down the street. When I am out with Cali, whose mission in life is to meet every human on the planet, it’s not really a problem. But many people who work with service dogs dread the question. What usually happens after the questioner gets an answer is that he or she then … calls to or greets the dog. For someone who’s working with a service or guide dog, the distraction is problematic. Yes, most guide and service dogs are very well trained and are generally focused on their work. But they’ve also been taught to be responsive to their names. People calling their names might provide enough of a distraction that the dog misses something important. Most working dogs are taught to greet people politely when their human partner says they can but not to solicit attention. The repeated cycle of strangers calling the dog’s name and getting excited when the dog looks or approaches them rewards the dogs for paying attention to people other than their partners — while working. This is also problematic, especially since many service and guide dogs are naturally very friendly. Not greeting approaching people already demands self-control. They’ve already got a lot on their plates. Why push it? The bottom line is that calling to or petting a working dog makes the dog’s task harder. 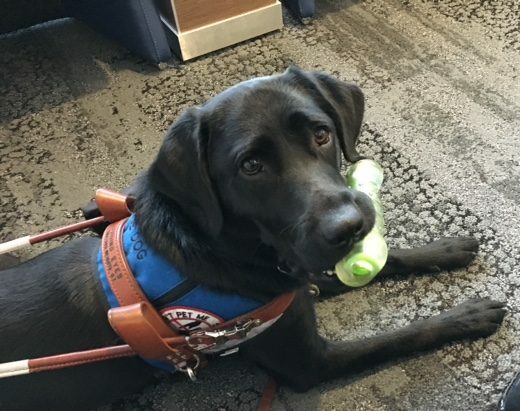 So while it’s natural to want to ask the dog’s name and you’re just being friendly — if you’re chatting with a person who’s working with a service dog, please don’t. ← Can my dog be vegan?